Culinary Fight Club is a lively, interactive cooking competition that brings chefs together to duke it in the kitchen. Each event is unique as various themes are explored. I had the pleasure of attending the Final Plate here in Chicago where 20 Culinary Fight Club champion chefs from 9 cities battled for the title of Final Plate Champion and the prize of $10,000. The high energy 2-day competition held at the gorgeous Morgan MFG in Chicago’s West Loop Neighborhood did not disappoint! The best part about Culinary Fight Club events is that 20% of proceeds from the competition benefit Fight 2 Feed a 501(C))3 charitable organization whose mission is to reduce food waste by partnering with chefs, food trucks, and restaurants to provide food for the hungry. 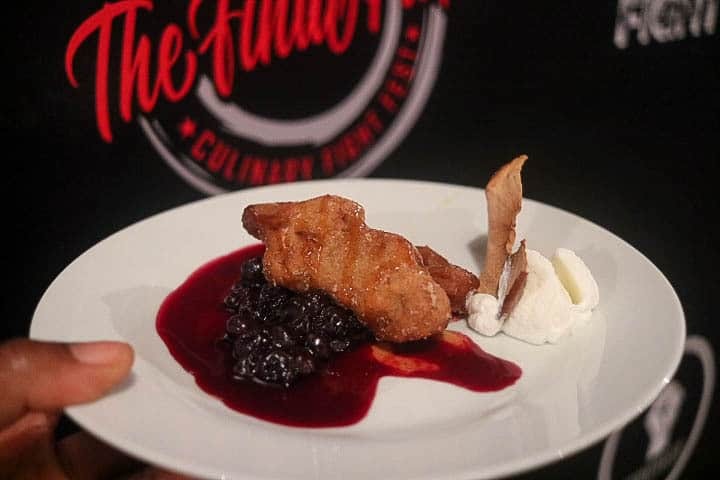 During the first day of competition, Culinary Fight Fest, the chefs presented their best bites to guests who cast their votes for their favorites; the top 4 chefs from the day advanced to day 2, the Final Plate. Cheferees made sure the chefs were following competition rules. The chefs were given a basket with secret ingredients and forty-five minutes to prepare their best dish. If that wasn’t enough pressure, guests and judges were in the mix firing off questions while they cooked. It was quite intense for the chefs. It was exciting to watch! I especially appreciated how friendly the chefs were and the camaraderie shared between them. Although they were competitors they were each supporting the other. Great sportsmanship! Spectators were questioning the chefs as they created their dishes Wonder what’s being discussed here, lol! Mark Nureddine: CEO/Founder Bull Outdoor Products, Inc.
After each of the chefs presented their creations, the judges gave comments and scores. The scores from the judges counted towards a large portion of overall points. However, the next phase involved a four-course meal with each chef serving a course with the audience casting votes for their favorite. The votes from the audience were then tallied along with the judges’ scores to determine the winner. I was torn between Chef Greg’s Pork and pepper salad. And Chef Ryan’s Apple fritter. In the end, I went with Chef Ryan’s Apple Fritter. The fact that he could get me to fall in love with a dessert over a savory dish is a big deal. I was blown away by the fritter. It was excellent with a perfect balance of sweet along the tart of the blueberries! In the end Chef Greg was crowned winner of the night! My son and I enjoyed the evening and new experience; I’d definitely recommend others go if the tour comes to a city near you! Use CLUBCFC2018 for $50 off events!